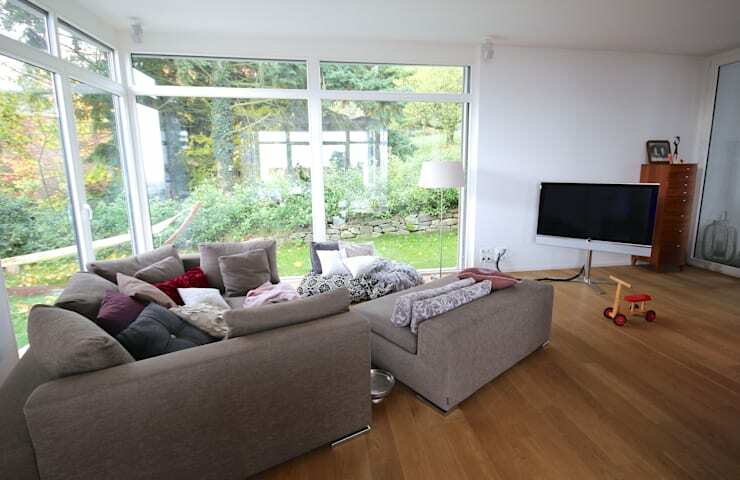 Today, we are going to visit Königstein im Taunus in Germany, where design professionals Raumatmosphaere Pantanella transformed an old, run down home into a modern masterpiece. As we explore this home, we will see how it evolves from an old-fashioned home that you wouldn't look twice at, into a contemporary oasis where we feel relaxed and reinvigorated just looking at the design! This home can also teach us how we too can create beautiful and peaceful spots throughout our own homes, where we can recharge our batteries and feel at peace among our favorite things and people. 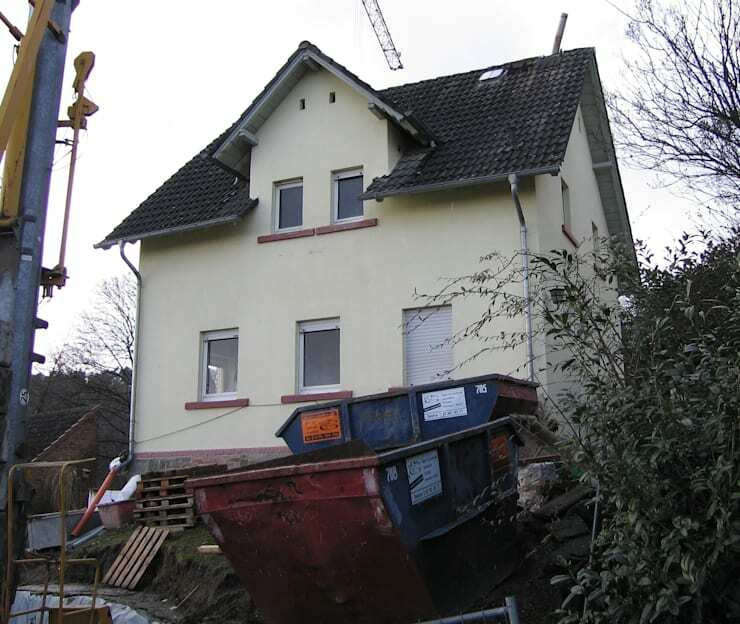 We can see that prior to the renovation, the home was in a sorry state. The roof looks very old and tarnished, while the colours are faded and washed out. The shape of the home is also old-fashioned and outdated. Built in 1898, the property simply didn't meet the living standards we look for in a home today. All the elements of the house, except for the structural elements, were removed in order to renew the property almost completely. 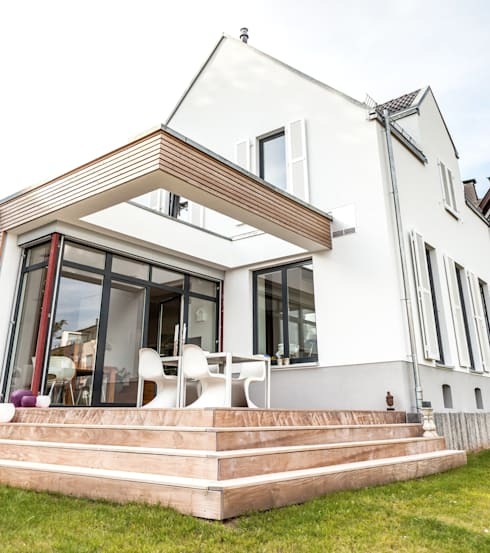 The facade and the exterior of the home has been completely transformed into a modern masterpiece. The old fashioned structure has been enhanced, with different volumes and shapes added to create a far more up-to-date look and feel. The white facade works in harmony with the wooden finishes, while touches of grey add further colour and texture to the environment. The garden is also vastly improved, with a neatly manicured lawn. The designers also opened the interiors out onto the exterior spaces, creating an integration between the two thanks the use of glass throughout the design as well as the installation of a large terrace. This physically expands the living space as well, while allowing the home to work in harmony with nature. Are you curious to see more of the finished product? If we enter the home, we come across this gorgeous and quirky staircase that twists up onto the second floor. The wooden stairs bringing a warm and earthy touch to the white space, while the antique table adds some charm and personality to the home. Remember that your home should feature items that appeal to you! Don't be afraid to add your favorite artwork or family photographs or pieces of furniture that you've fallen in love with. This image also shows how the designers have utilized functional items as design pieces in the home. 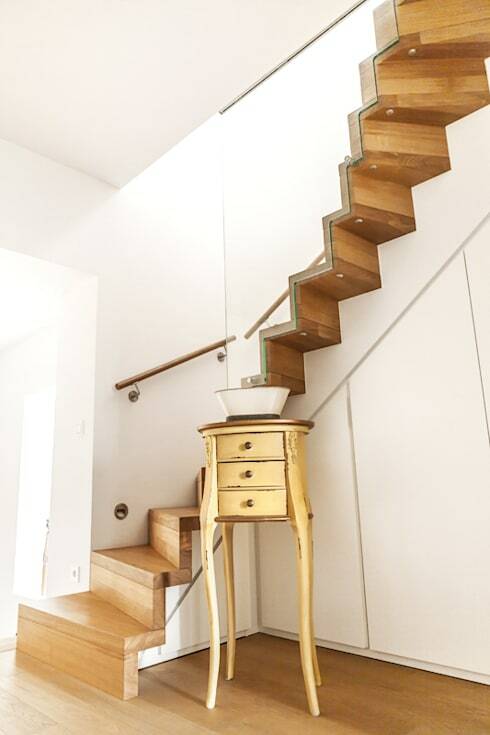 The stairs add as much charm to the home as the little table. Have a look at these other wooden staircases that wow! Do you see what we mean about personality? 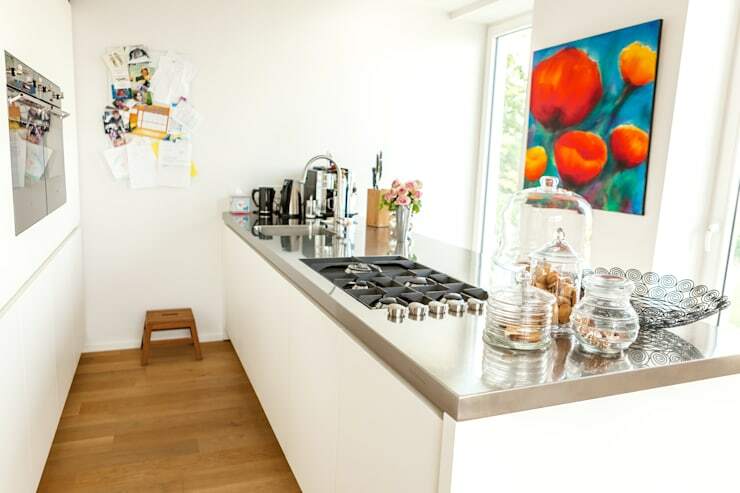 The designers have added some bright and bold artwork to the kitchen, which transforms this house into a home. While the kitchen is neat and organized, it also features items across the counters including sweet jars and vases of flowers, which enhance this space and remind us that real people live here. This is a great design tip! Just be careful not to end up cluttering or crowding your counter tops with too many objects and items. Make use of your storage space, keeping anything that isn't decorative or necessary neatly out of sight. 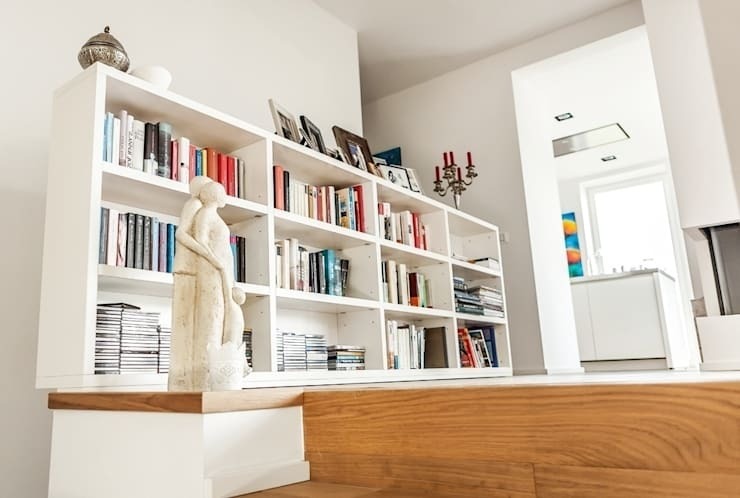 In this area of the home, we can see how a bookcase houses personal books and family photographs, again showing us how much of an impact personal items can make in the form of design and decor. A little sculpture also enhances this space, adding beauty and a sense of warmth to the home. Remember that bookshelves are wonderful in that they can store so much, while taking up very little space. Have a look at these things to consider when choosing shelves. The family room is very trendy and stylish, but also comfortable and functional, showing us how the designers have managed to achieve that balance. Thanks to the newly incorporated large glass windows and doors, sunshine and fresh air flows through this space, which makes it that much more appealing and inviting. The neutral colour palette introduces warm tones, while the patterned and colorful cushions add life and soul to the room. You'll notice that lamps have been installed in this space, which is a great tip! You want your living room lightIng to be soft and appealing, creating ambiance and a soft glow. This is a kid's bedroom worth taking note of! For starters, the designers used a soft, neutral colour palette, like we've seen throughout the rest of the home. This allows the foundation of the room to remain the same throughout the child's life, with only a few decor items and accessories needing to be changed as the child goes through different phases of his or her life. This room is packed with personality and charm, however, thanks to posters on the wall, wall art, picture frames and funky lamps. The wooden ceiling beams remind us of the original structure, bringing in a hint of the traditional and the rustic. 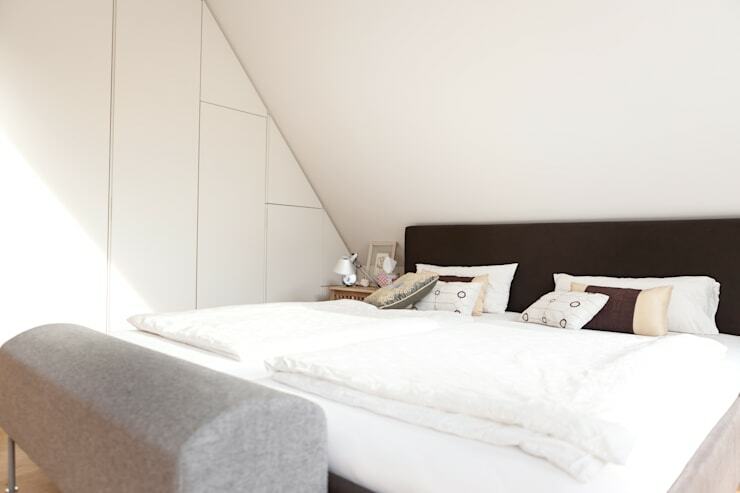 The main bedroom is a lot more sleek and minimalist, with a very simple design. White is the predominant colour, with touches of brown. On the left, we can see plenty of storage space across the entire wall, which creates a space to store all personal items neatly out of sight. This minimalist style ensures that this room truly becomes a haven, where one can escape from the hustle and bustle of family life. If you have an expansive property, you want to make the most of the space available to you. 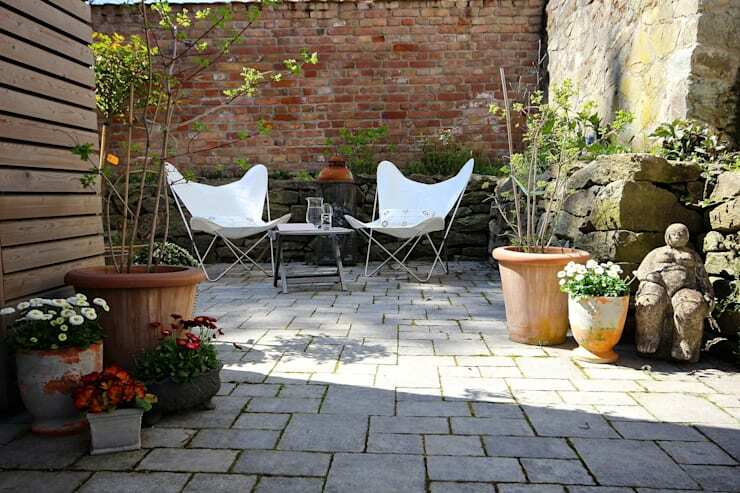 By building a little terrace, you can not only enjoy the sunshine and fresh air in summer months, but you can expand your living space. We saw the terrace that the designers had built in the one of the first photographs, but in this image, we can see how they've created a simple sitting area in the backyard with two camping chairs and a little table. This is the perfect spot for sipping morning coffee or sharing a glass of wine among the flowers and the trees. Do you see how easy it is to create beautiful little spots of peace and tranquility? The integration between the interior and exterior spaces never ends in this beautiful home. In this image, we can see how this wooden terrace provides a perfect outdoor dining area. The designers have added a durable dining room table and chairs to the space, while ensuring there are plenty of colourful cushions for comfort and style. The bright yellow umbrella is the cherry on top of this design, merging functionality with trend. What is your favorite part of this new home?